September 09, 2018 at 3:18 pm. BALTIMORE — A driving rain and strong winds could not stop the revamped Baltimore Ravens. 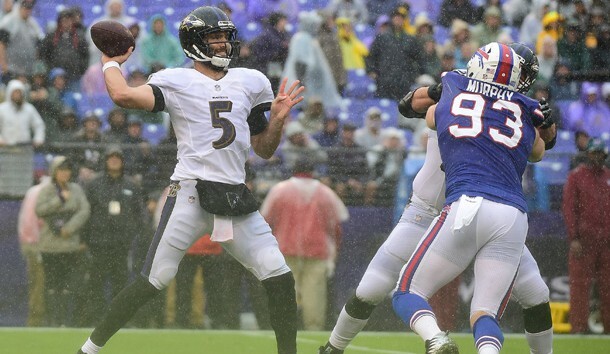 Joe Flacco threw touchdown passes to all three of his new receivers and the Ravens overwhelmed the Buffalo Bills 47-3 in the teams’ season opener Sunday. Baltimore now has a quick turnaround for a road game at Cincinnati on Thursday night. Flacco was 25 of 34 for 236 yards with the three scores and finished with a 121.7 passer rating. Receivers John Brown, Willie Snead, Michael Crabtree, each acquired in the offseason, came up big in their debut with the touchdown receptions. Don Martindale also was impressive in his first game as the defensive coordinator. The Ravens finished with six sacks and allowed 153 total yards. Safety Tony Jefferson and cornerback Brandon Carr each had an interception that led to scoring drives. Buffalo quarterback Nathan Peterman made his third career start and was under pressure for much of the game. Peterman was just 5 of 18 for 24 yards with a pair of interceptions and had 0.0 passer rating. He was benched for rookie Josh Allen midway through the third quarter. Bills running back LeSean McCoy was held to 22 yards on seven carries. The Ravens opened the game with impressive 10-play, 80-yard scoring drive, capped by an 8-yard run by Alex Collins. Baltimore extended the lead to 14-0 on a 7-yard touchdown pass from Flacco to Brown. Cornerback Tavon Young, who missed all of last year with a torn ACL, registered the first two sacks of his career in the opening quarter. Justin Tucker hit a pair of field goals and Flacco threw a 12-yard touchdown pass to Crabtree for a 26-0 lead at the break. The Bills did not record a first down the entire half. The momentum carried over into the third quarter as Buffalo punter Corey Bojorquez could not handle a snap deep in his territory, setting up a 13-yard touchdown pass from Flacco to Snead. The interception by Carr led to a 1-yard scoring run by Javorius Allen. Fellow running back Kenneth Dixon rounded out the scoring with a 2-yard run. A 35-yard field goal by Steven Hauschka spoiled the shutout with 2:38 left in third quarter. NOTES: Bills coach Sean McDermott and Ravens coach John Harbaugh worked together for the Philadelphia Eagles from 1998-07. … Ravens rookie Lamar Jackson got the nod as the backup to Flacco. Robert Griffin III was inactive. Baltimore is carrying three quarterbacks on the 53-man roster for the first time since 2009. … Phillip Gaines got the start for the Bills at cornerback ahead of Vontae Davis, who was a healthy scratch. … Ravens cornerback Brandon Carr made his 161st consecutive starter, most among active defensive players. … Baltimore rookie Janarion Grant had a 51-yard punt return that led to a field goal by Tucker.